Peas straight out of the freezer can be a delicious addition to salad greens and keep the salad cool and fresh. This is a guide about using frozen peas. For a fresh taste to green salads I put a sprinkling of frozen green peas on top. It keeps the salad greens crisp and adds a fresh picked flavor to the salad. 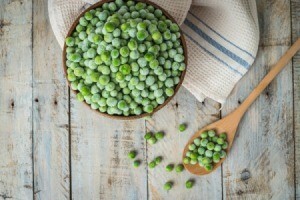 Can you eat frozen peas and carrots raw when you get them from store? First of all, yes, but they will not be very tasty. And second frozen vegetables usualy are half-cooked so it wouldnt be a problem at all.